The preschool students that I work with do love this Spot it!. 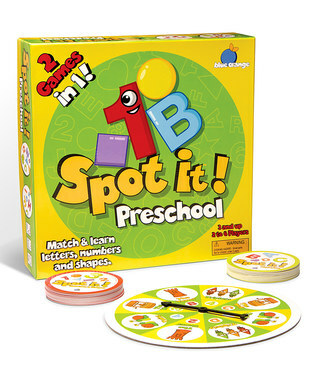 Naming shapes, letters, numbers and colors are perfect practice for them. I have a few Low Incidence students who struggle with word recall so this game is a fun way to give them lots of practice. Loving this game! 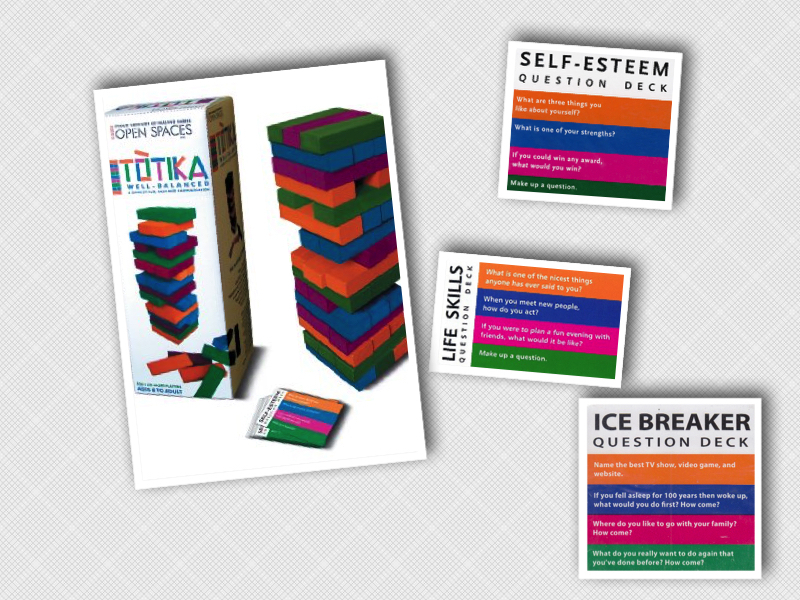 There are question decks for ages 8 and up. Last week we had a laugh riot over one question- What is the silliest reason that you have had a fight with a friend? Turns out a meatball can cause a big fuss! The Flexible First Graders are back on track and learning how to defeat yet another Unthinkable. This time it is Brain Eater. Brain Eater can distract you from doing important things like get ready for school, do homework, and focus on the lesson in class. 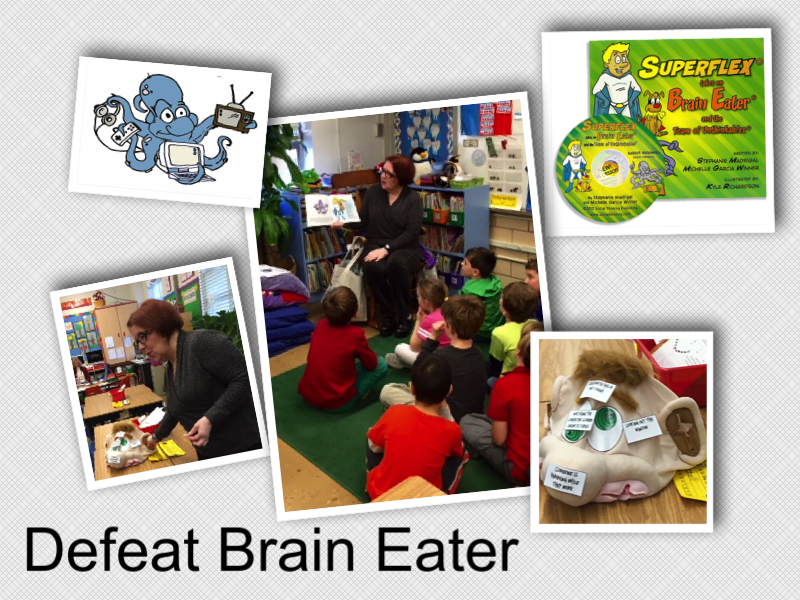 Brain Eater uses distractors like TV, video games, velcro on a shoe, or thoughts about your upcoming birthday party! I introduced the class to Brain Eater by reading a portion of the book, Superflex takes on Brain Eater and the team of Unthinkables by Stephanie Madrigal and Michelle Garcia Winner. They were all quite sure that Brain Eater had had an effect on them many times. We talked about strategies that could be used to defeat him. The book includes a coloring sheet of the Superflex distractor shield which can be placed over the object that is distracting (toy or screen). This class is very clever when it comes to thinking of ways to be flexible. Next, we watched this super funny video showing what it looks like when Brain Eater is on the loose at school. Finally, Ned’s Head made a great prop for showing the student’s how some distracters are inside our heads (sticky thoughts and worries) and some are outside our heads (classmate humming while he works). 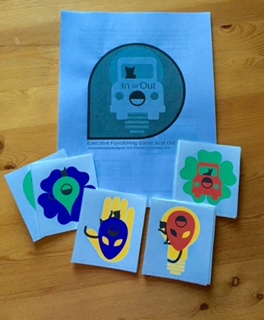 This activity is from Jill Kuzma’s website at http://jillkuzma.com. 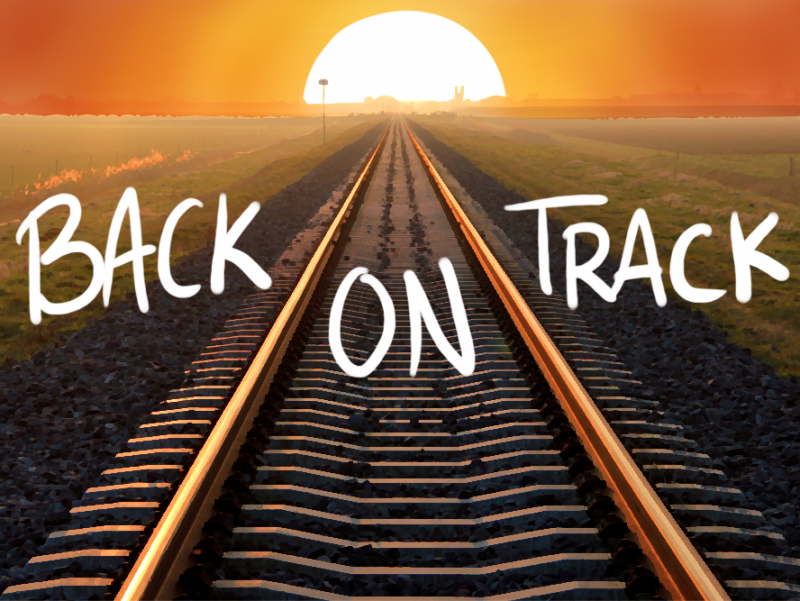 Anyone else struggle to get back on track last week? I am not bouncing back from the Winter Break as quickly as I normally do. The fourth grade Lunch Buddies really like Catan. We are still learning how to play this game but having fun while we learn. Catan is a strategy game. In play, one must think deeply, creatively and critically. 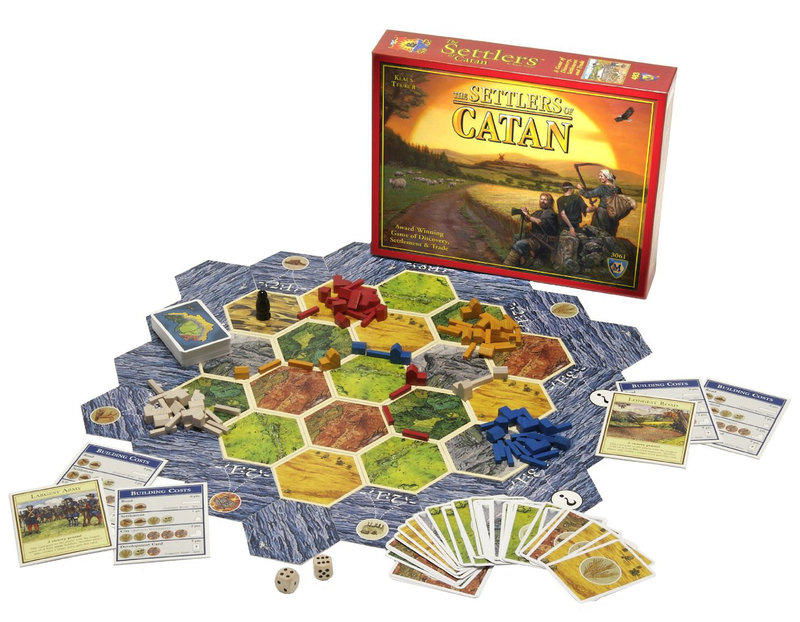 Catan helps players develop negotiation skills because one must trade to succeed. 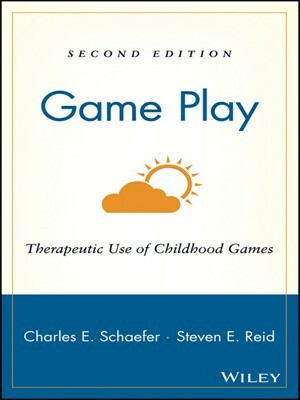 When you bring a new game to your therapy room do you often hear, “I don’t know how to play that. I don’t want to play.” I don’t hear it as often as I used to because the Lunch Buddies have learned to be more open to new things and flexible about game play. 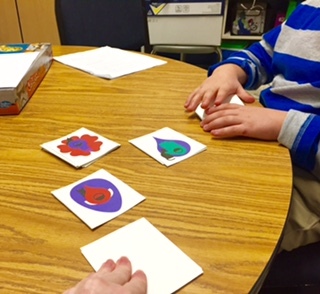 When I introduced this executive functioning game last week, I had to flex my thinking skills along with the students. It took me longer to learn what to! Executive Functioning Game In or Out strengthens executive functioning skills, working memory, management of distractions, attention to detail, response inhibition, sustaining attention and mental shifting. It is available as a download at http://goodsensorylearning.com. I use several of Dr. Erica Warren’s cognitive remedial products for working memory, following directions and reversing reversals. Check back ’cause there will be a Part Three! 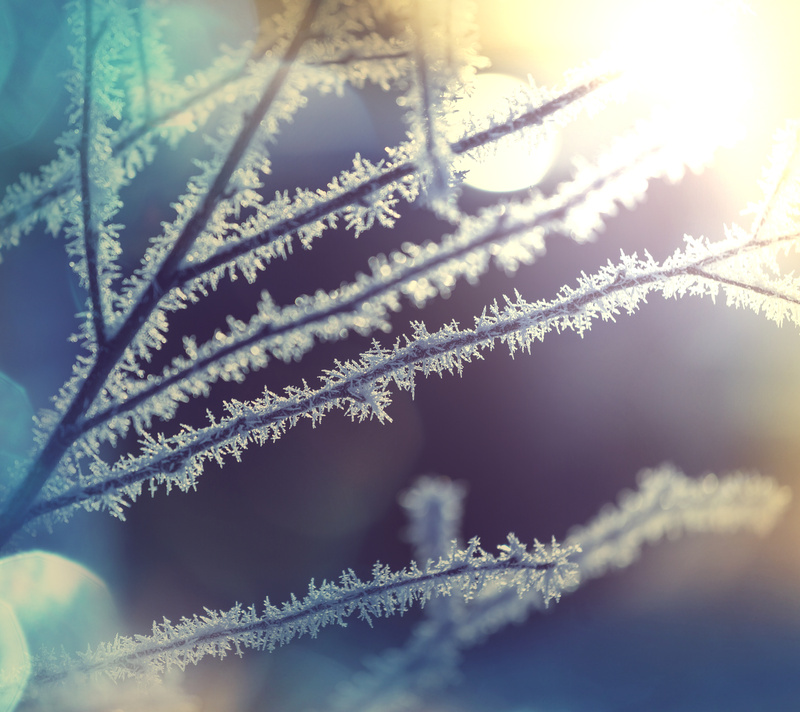 I hope that everyone had an enjoyable and restful Winter Break. 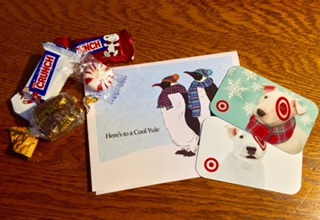 Maybe you got some gift cards and are thinking about redeeming them for games to use in your therapy room. I am so fortunate to work with such generous children and parents. I found some good reading to assist me in making good shopping choices. 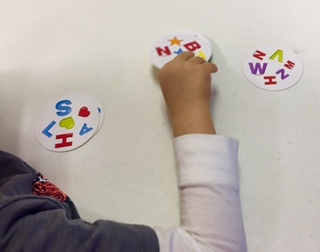 Guest blogger, Kim Peterson, MA,LPC-S, RPT, details fifteen ways in which we can use non-therapeutic games to help gain a greater understanding of our student’s strengths and weaknesses as we observe their behaviors and emotions during game play. 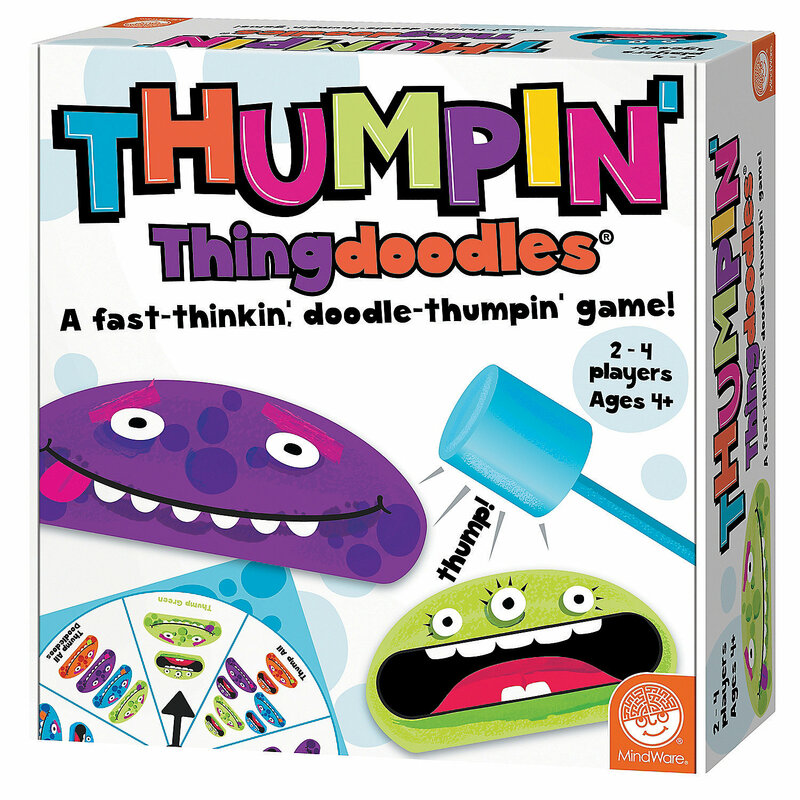 Thumpin’ Thingdoodles builds color recognition and motor skills. I think it will also serve as a brain break and help with mindful impulse control. I bought this game from http://www.mindware.com. This book has been around a while but it is new to me. 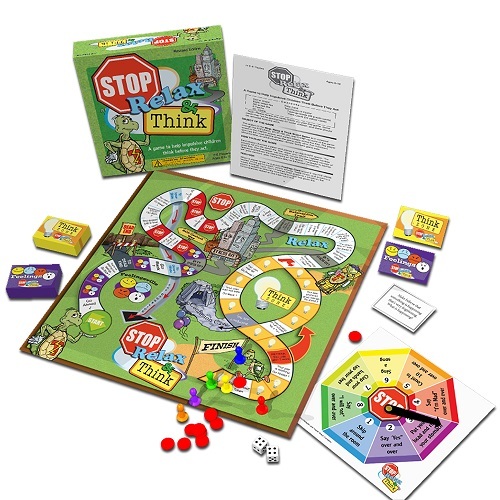 The Stop, Relax, and Think game is a cognitive-behavioral educational tool for children to learn feeling awareness, self-control, relaxation, and problem-solving skills. It provides fun opportunities to practice the actual stopping of a behavior and learning to catch themselves before an automatic response or reaction occurs. I have read many reviews of Stop, Relax, and Think and they all report how popular it is with their clients. Looking forward to playing. I am just getting started so check back this week to find out what other games I bought and what the students are saying about them. PS What games are you playing in your therapy room?